The students are very excited to be creating their own blogs. Carol and Steve take you on a short tour of Aspen, Colorado. Enjoy the sights, snow and soup! 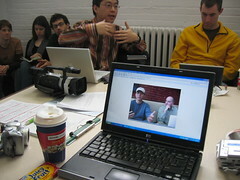 We had the first Node101::Boston Media Makers meeting yesterday. What a turnout! We had over twenty-five people meet up at Sweet Finnish in Jamaica Plain. After mingling in the cafe, we moved into the conference room. After I welcomed everyone, I shot a quick video with my Canon S400, (this is it), and then explained what node101 is. It's all about media as conversationa and not a lecture, so next we had each person introduce themselves and talk about what they are most interested in. There were 4 or 5 video cameras at least grabbing footage of what everyone said. I'm sure that will come out soon. I've got two tapes, one from me and one from Michaeael Oh of Tech Superpowers was there to explain the Pulse Point that's being installed at Sweet Finnish, and also how Tech Superpowers wants to be a source of support for this group. Amy Carpenter talked about the SIM program at Mass Art where one meeting a month is a big meeting and the other meetings are self organizing where you need at least two people to meet to talk about a topic. We all agreed on this. The next big meeting is Sunday February 5th at 10 AM where Aaron is going to do a presentation on how to make better videos. Everyone was excited about hearing Aaron share his knowledge. I'll be putting up a site for node101::Boston that will include a forum for us to use to plan future meetings have discussions. Some researchers claim that aspen form the largest living organisms on the planet, and could also be among the oldest. My report on NECN's citizen journalism initiative aired on Rocketboom on January 24th, 2006. Hi Rocketboom viewers!